The GUARDIAN has often noted Boise Mayor Dave Bieter and his “Team Dave” to be the most adept politicos in Idaho. Not to disappoint, he has launched Boise Kind, which a city press release claims, “is a community-wide initiative that highlights, protects and promotes the community’s core values and helps to ensure Boise remains kind and welcoming.” AND just in time for his reelection campaign! A program of this magnitude brings in the Boise Schools, Idaho Power, the Chamber of Commerce and other leaders. The brilliance of the campaign is that “we the people” get to spend $80,000 in tax money to make it work. 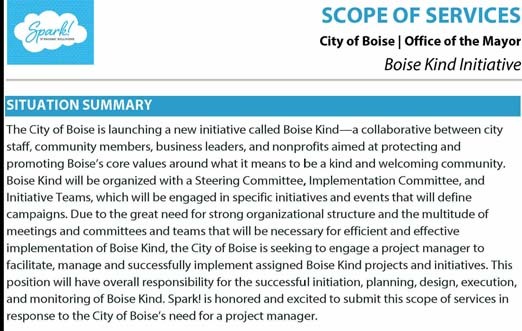 While the local newsies were eager to promote the Boise Kind idea, they weren’t as eager to share the $6,500 monthly fee the City agreed to pay Spark Strategic Solutions to keep Candidate Bieter before the voters during the year-long Boise Kind campaign. A reader sent us documents showing the “City of Kindness” scam is far flung and was a Hollywood publicity stunt to kickoff the LIONSGATE film, “Wonder.” This scam reminds us of the “Ten Commandments” tablet which was a promo for the film of the same name. That fiasco had the City remove a granite stone from Julia Davis Park, a petition drive by Christians to replace it, and a City defeat in the Idaho Supreme Court. –Lead the development of the framework, process, and engagement strategy for the overall initiative. 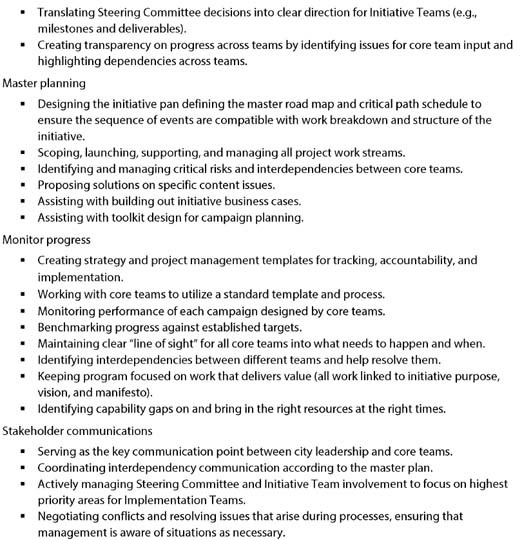 –Translating committee decisions into clear direction for initiative teams (e.g., milestones and deliverables). –Benchmarking progress against established targets. –Providing executive support to the steering committee and initiative owners regarding the process to develop campaign plans. If we didn’t know the citizens of Boise are paying $6,500 a month for this program, we would think it came from a cattle feedlot or was part of the composting program! This will be used to try to suppress dissent and citizen concern about actions of City officials. And I suspect part of the hefty monthly Consultant fees will go not just to writing puff pieces, but also to more subversive on-line ways to try to track and “diss” Bieter critics/opponents. I just saw one official’s FB post last night that promotes “shaming” of others. Since when is it the City’s role to shame citizens? But I think most folks will see through the blatant hypocrisy of City leadership that is so cruel and heartless in the Decisions that are being made telling others to be nice. Case in point: 2 weeks ago – ALL Council members voted in favor of a diesel truck terminal developer as they feigned ignorance of the effects of heavy duty diesel exhaust exposure in 500 Blue Valley residents. #BoiseUNKIND #Unlivable. The City of Boise also has retained Strategies 360 to lobby and mold public opinion on the stadium project ($65,000 Purchasing Contract # EX19-220) and on basing F-35s at Gowen Field ($5,000/month retainer + $125/hour). Last year the city also spent $1,225,000 on its own 20-member “public engagement” staff. In this observer’s judgment, they have failed to identify their “publics,” let alone “engage” them. Is this a message for mass distraction? Mr. Bieter, would you please be so “kind” as to step aside and let someone else run the mayor’s office? Bieter hasn’t been able to springboard to higher office after 15 long years as mayor and is probably otherwise unemployable outside of politics. This “Kind” initiative looks like a rather desperate attempt on the part of Bieter to keep his job. To potential challengers I would say that it seems Bieter feels vulnerable and knows that many of the issues as discussed here could be used effectively to win the election. Nothing Boise Kind about higher taxes and fees on me to pay for crap in the northend and downtown. I’ve heard the Boise ‘registered neighborhood associations’ will be given taxing authority in some creative way. This will allow more money from outside the city to flow to Team Dave. The registered what?? No, it’s not your HOA. It’s a gimmick. A play on the HOA name recognition. The Boise registered neighborhood associations are the pretend groups Boise city leaders interface with to pretend they are consulting with residents. It allows them to do whatever they feel like doing. We don’t need these puppet associations pretending to represent us. We need election districts and council members from each district to dilute the power of the northend. It’s not clear how the geographic boundaries where drawn. Perhaps the same as the colonial powers dividing up Africa and Asia? When will Mueller start investigating Mayor Bieter? I saw this coming, my daughter was in the Boise Independent School District and they have been doing this for 3 years. Everyone gets a kindness t-shirt, recites the kindness pledge and weekly kindness meetings. So is Team Dave going to sit at the city meetings wearing a “Be Kind” t-shirt and have everyone recite the kindness pledge. Then they could hire a kindness monitor, at 60k a year, to monitor the meetings. So when you are mean to the man, they can tell you to sit down because you broke kindness rule #2???? So once again we see the Mayor SPEND city funds on PUBLIC RELATIONS to buddies to try to make him look good. The real concern is that we do not have a single Council member that is willing to challenge all this spending – in fact they promote it. Pseudosuze: Yes. I am experiencing that, too – including someone wanting to be a “friend” with the same name who was not the same person. What we’re seeing now with comments having to do with the Library or Stadium is VERY similar to what took place here a couple years ago with F-35s – and what we are likely to see when the latest Draft F-35 EIS came out. Mindless aggressive hyper-defensive comments in support of F-35s quickly appeared. Recently the same thing with the Stadium. Turns out that a couple years ago the City had hired a Consultant to track/spy on-line articles and social media, and report to them (so a counter-offensive could be waged). I believe The Boise Guardian ran an article on the Contract with that F-35 “spying” consultant group. We need to keep in mind this “Spark” Contract is just one of many contracts the City has with Consultants to do all kinds of manipulation of public opinion to favor the City’s agenda. Plus they have a sizable number of their own staff doing the same thing. Be Kind and Welcoming to the invasion of those escaping other states, so the developers can turn Boise into a replica of Los Angeles. Be kind & support me! Be kind & support unchecked growth! Be kind & support the F35 nonsense! Be kind & support the Library! Be kind & support the ball field! Be kind & support higher taxes! Be kind & support corporate profits! Be kind & support no citizen input! How about Be Kind and Rewind like was said in the 80’s and just say no to team Dave. This is highly predictable. This whole “Boise Kind” schtick is a social credit scoring prelude that will equate any viewpoint opposed to the Downtown Politburo with holding a “hate speech” mindset. The entire media system is fully corrupted with this Newspeak model. Orwell’s nightmare is here. This program is designed to protect the Obama State Department’s plot to seed thousands of refugees into U.S. cities, fueled by Deep State warmongers that created the impetus to drive them here. They also demand that illegal immigration be fully accepted, without question or you are racist. Okay…that would make Cesar Chavez Racist #1 because he opposed illegals more than anyone else I can imagine. Go look it up. He made Trump’s ICE look pretty nice, in comparison. Dems need fresh voters because going full commie is not what the heartland will accept and when the Green New Deal gets going, your average liberal is going to rethink their politics as well. Get to know those electric scooters, because that’s gonna be your ride of choice if these Marxists get their way. I know this because I have been right in the thick of the discussions about what is “good” for the people, regarding social justice and equities and the like. It goes way beyond legit concerns about homelessness and poverty. This is about cataloguing EVERY aspect of your life, down to the pencils and clothes and other stuff you have. This is about social voting to determine what your neighbor can have or not. And with such vocal luminaries like the Twitter stars and MSM know it alls telling everyone how to think….how do you think YOU will fare in such a society. This is why I walked away from the so-called Progressive concept. It’s all a pack of lies. It’s slavery. When people (any govt agency) have extra money, they will spend it. Haven’t heard this. Is it to endear NA’s to the Mayor and his administration? They are not political subdivisions. This would be unheard of. Keep us updated on that, please. It is not just Boise doing it. Team Dave is using the playbook of Charles Manson and other cult leaders. Who did Mayor Bieter buy those delicious chorizos from and how much did that cost the taxpayers? Does the new kindness campaign properly address the looming issues that face so many large cities? Forced Air you go on an on about big principles in politics that aren’t really germain to the issue or the solutions to the communities problems. Are you a troll? Give us an opinion on the issue in the article, or better yet a solution and I will thank you rather than call you out. Because KIND is now the new LIVEABLE— that’s what this is all about. Because the City’s trademark term “best liveability” (which my phone just tried to autocorrect not recognizing it as a real word) now has associated very negative conatations. Because people are finally waking up and paying attention (sadly, far too late) — realizing and trying to fight back and against the numerous problems that have been wrought down on us by the City/Chamber/CCDC’s decade-long persistent campaign that Boise is THE MOST LIVEABLE city EVER! Because now we are facing ridiculously high housing costs, low wages, increased crime, traffic congestion and all the many complex and nearly unsolvable problems related to unchecked growth. Because Boise is no longer LIVEABLE, we must now be KIND. I wonder if there’s a top ten list for that?